Betty Jane Thomas, a long-time resident of Naples, Florida, passed away Wednesday, April 10th at Naples Community Hospital. Born in 1941 in Columbus, Georgia, she received her Cosmetology license in the early 80's. She worked in cosmetology for many years, was a long time employee at Wilderness Country Club and worked in home sales at Sunshine Ace Hardware for the last 18 years, where she was still employed. Betty enjoyed working at Sunshine and helping customers. 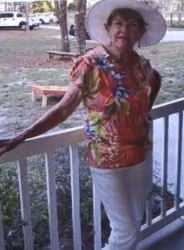 She loved fishing, playing Bingo and spending time with her family and friends. She never met a stranger and everyone who met her loved her. She is survived by husband Harry of 39 years and children; Debbie (Brad), Sherry (James), Michelle (Sammy), Harry Jr. (Misti) and Kally (Jim). Betty had 17 grandchildren and 27 great-grandchildren which made her very proud. She was preceded in death by her son Larry. A memorial service will be held on Tuesday, April 16, 2019 at Fuller Funeral Home East Naples. Viewing and visitation will be from 11:00 am-12:30 pm and services will begin at 12:30pm. Burial at Marco Island cemetery will immediately follow.